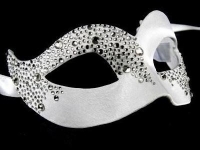 Look beautiful & feel on top of the world in this Murano Strass Venetian Mask. Brought to you in luxuriant gold, the Murano Strass gold edition features intricate macramé lace as a setting for the shimmering Swarovski crystals & beads. This mask is truely a work of art to look at as well as wear. Black ties finish off the mask for a secure fitment. Like every Simply Masquerade Venetian luxury ball mask, the Murano Strass Gold Edition is hand made of superior quality in time-honoured Venetian tradition. Great for women to wear, If you want to be different, to impress without being arrogant, you will appreciate the beauty of this masquerade mask. Vintage inspired the Murano is fashioned in the true traditional style. There's a hint of Venetian theatre in the Murano. Create a glamour look to co-ordinate with the chosen theme of your masquerade ball, black tie event or wedding. The Murano is the masquerade statement you’re looking for – luxury with a subtle extravagance.